Magna Welding Alloys is a division of Magna Industrial Co. Limited. Magna Quality Products have been among the world’s finest welding alloys and accessories for more than three decades. Our quality products are engineered to Lower Your Costs by substantially Reducing Downtime and Waste. Magna quality products TAKE THE GUESSWORK OUT OF MAINTENANCE because they are engineered to compensate for the more difficult maintenance conditions. At Magna, Our focus is exclusively Total Quality Maintenance Solutions. Magna provides only Total Quality Welding Alloys because nothing is left to chance in their design and production. Magna alloys are premium products because of their outstanding quality. They are engineered to save you from costly BREAKDOWNS, repetitive REPAIRS and disastrous production DOWNTIME. You can trust Magna…. Our quality is guaranteed. MAGNA 28 Super TIG Al-Bronze Alloy is a superior non-rusting TIG filler metal for rebuilding or overlaying metal against the most stressful wear and corrosion. MAGNA 38 Super High Corrosion ResistingStainless Steel Alloy is a super high corrosion resistant alloy to be applied with TIG Welding process for stainless steel welding. MAGNA 39 FC TIG "RootGard" is a state-of-the-art flux-cored wire that promotes genuine cost & time saving in maintenance welding of pipes & vessels. Electrode Chamfers, grooves & gouges practically all metals in seconds - without special equipment or skill. Electrode Contains special flux coating to promote exothermic action for fast cutting rate. Quickly cuts or pierces practically all metals without special equipment. for Copper Alloys Joins wide variety of dissimilar metals. Reduces heat damage or the need for preheating. MAGNA 303 Super-Strength Non-Cracking Alloy for All Steels Non-cracking with super strength for all steels including high alloy steels. Provides excellent corrosion resistance and heat resistance. GOLD Ferrite Balanced Super-Strength Non-Cracking Alloy for All Steels Welds dissimilar metal combinations and gives a deposit length that is 20-25% more than normal electrode. for All Steels For welding T-1 and other heavy duty steels, construction steels and fabrication. Provides superior crack resistance - even without preheating. for Mild Steel Provides extraordinary weldability for ease of use. Ideal for "on-site" and restrictive position use. MAGNA 309 FC TIG "RootGard" is a unique flux cored TIG welding rod designed for root run application without the need of inert gas purging for back shielding. for Stainless Steel A superior "vertical downhand" welding electrode with improved corrosion resistance and heat resistance properties. Stainless Steel Provides superb weld integrity to resists corrosion and cracks. Offers good resistance to saltwater corrosion. MAGNA 400 Special Alloy for Crushing Equipment High alloy designed for crushers. Gives super impact and abrasion resistance. Electrode Tough ferritic matrix that resists both impact and abrasion. Outwears other electrodes that cost twice as much. 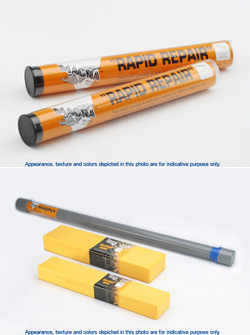 MAGNA 402 Impact-Resistant Alloy for Manganese Steel Withstand extreme shock, loading & impact. Ideal for heavy construction & mining equipment overlays and build-ups. High-Stress Abrasion Features a dense matrix impregnated with hard carbides to resist both high-stress and low-stress. for Extreme Abrasion Withstands even the most severe grinding abrasion. Outwear ordinary hardfacing rods as much as 30 to 1. MAGNA 405 Superior Build-Up Electrode Excellent for flame hardening. Non-cracking even on multipass deposits. Electrode Gives "stay-sharp" deposits ideal for high speed cutting. Withstands more shock than tungsten carbide - retains cutting edge sharpness. Electrode Welds practically all tool & die steels in hardened condition. Gives super hard & tough welds - without heat treatment. Alloy for Aluminum Gives welds that are stronger than pure aluminum. Provides easy slag removal. Burned Cast Iron Welds cast iron so greasy, rusty and burned that other electrodes will not even bond. Machinable Electrode for Cast Iron Gives perfect machinable welds on practically all types of cast iron. Requires absolutely no preheating. MAGNA 777 Generation II MachinableElectrode for Cast Iron Superior design enables economical use on virtually all types of cast iron. High-tech "controlled blast" pulse action automatically burns off surface contaminants before weld metal transfer. Nickel Alloys Resists high temperatures up to 1205°C to helps prevent cracking. Provides excellent corrosion resistance. Hastelloy Materials Provides outstanding hardness retention even at elevated temperatures. Outwears most hotwork tool steels - yet is entirely machinable. Alloy for Copper Provides super fluidity – flows through tightest laps. Low bonding temperature ensures extreme ease of use. Alloy for Steels Gives extraordinary strength. Highly versatile - great for use with variety of metals. for Dissimilar Metals Its extreme low-temperature application (179°C) provides outstanding versatility. Is ideal for all white metals, including zinc pewter and aluminum. MAGNA 55 Superior Alloy for Aluminum Universal alloy right for all type of aluminum,Its unique two-stage melting range for both thin-flowing and build-up applications. for Maintenance Its a "All-Purpose" high silver content brazing rod that bonds well to almost all ferrous and non-ferrous metals. Silver Alloy for Maintenance Completely non-toxic. Provides high elongation - with outstanding shear strength and tensile strength. Brazing Alloy Superior general purpose brazing alloy for cast iron and other metals. Provides easy "fool-proof" all-position application. Flux-Coated Brazing Alloy A tough strong joining and build-up alloy for cast iron and other metals.. Deposits are totally machinable. Solder for Stainless Steel 500% stronger than ordinary solders and is ideal for food industry and refrigeration applications. MAGNA 89 Superior Galvanizing Bar Gives all the benefits of "hot dipping" without the inconvenience. Needs no special equipment. MAGNA 904 "Heat-Ban" Jelly-like compound that actually absorbs and dissipates heat. It is safe to use on all surfaces. MAGNA 940 Instant Repair Compound on surfaces and parts made of steel, copper, aluminum, cast iron, stainless steel, galvanized, brass and chrome.